When having a baby there are so many things to think about. One of the most stressful things during pregnancy is preparing for your baby, not just mentally but physically having your home ready and suitable in time for the birth! A baby spends the majority of each day for the first few weeks sleeping, so choosing where your baby will sleep is an important decision. 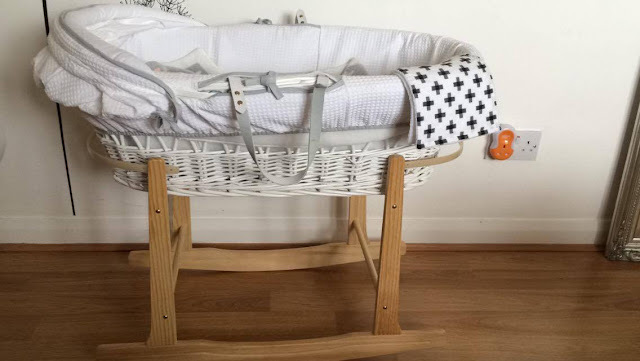 There are many questions you should consider when choosing the perfect crib or moses basket, like, is it safe? 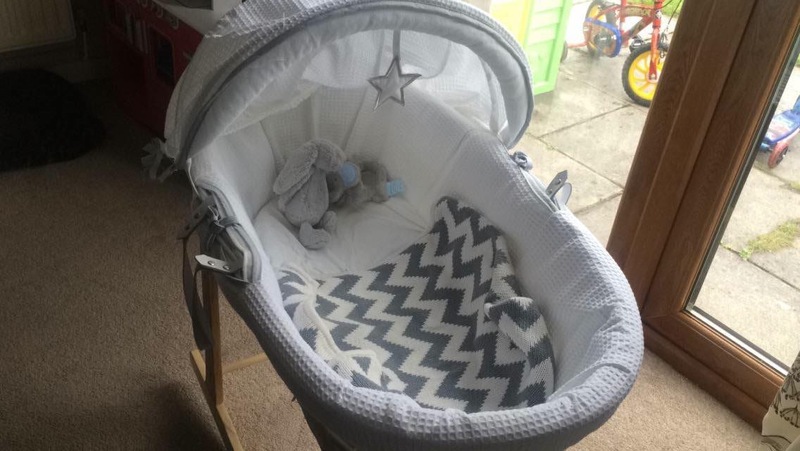 or; will your baby be comfortable? 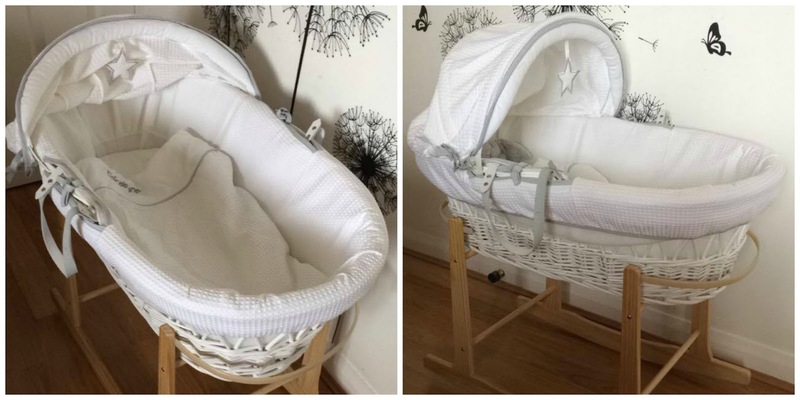 There is nothing more lovely than looking at a brand new moses basket all set up and ready waiting for your new born baby to arrive. 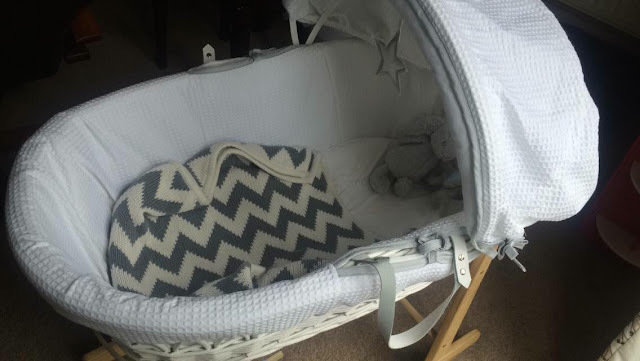 I had this moses basket for a few weeks before my due date and each time I saw it, I became more and more excited for the new adventure to start (and the sleepless nights!). 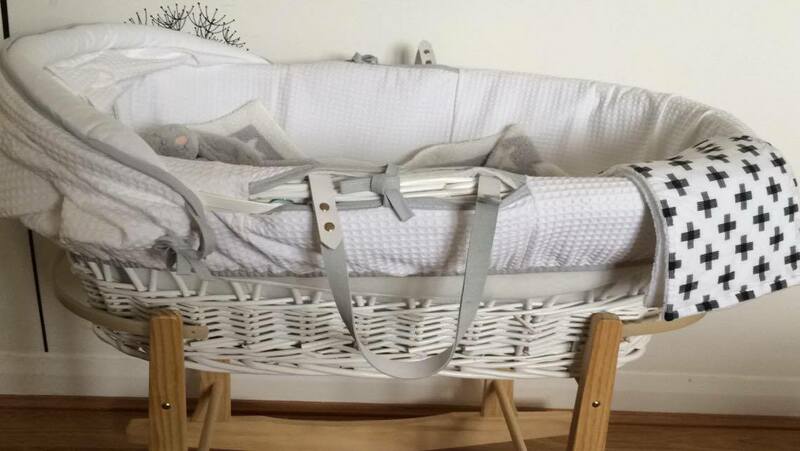 When I had Josh, he slept in a crib next to my bed in the night, and a moses basket set up downstairs for his daily naps. This worked well with Josh so we’ve decided to do it again with Freddie. 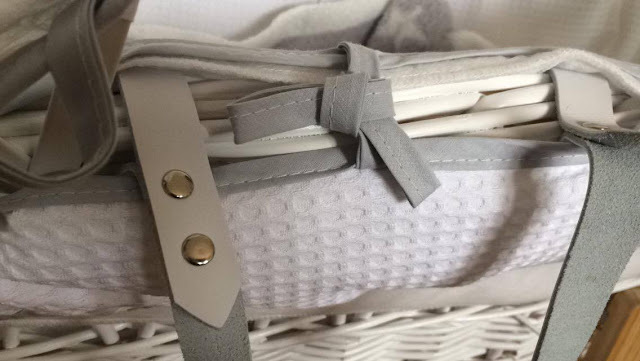 For his night time sleeping we decided on the Chico – Next to Me crib (review coming soon), and for the day time we were lucky enough to be gifted with this beautiful waffle moses basket by Clair De Lune. This moses basket really is beautiful and you can choose from white, dark brown and natural. 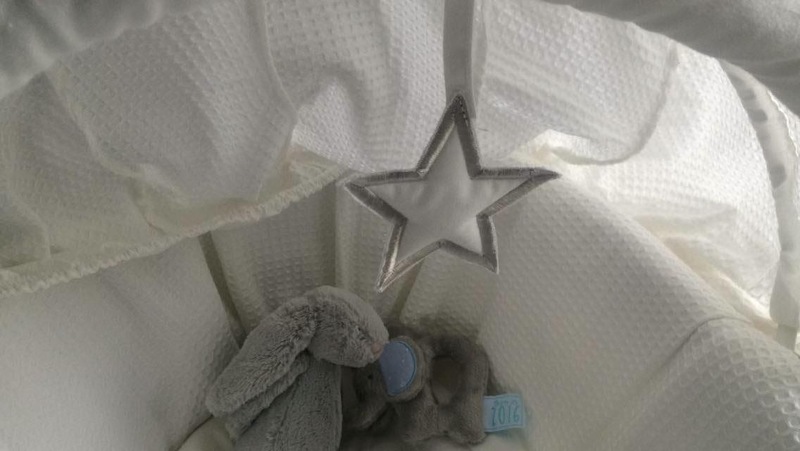 We went for the white and silver moses basket as that was the theme we already had planned for his nursery. 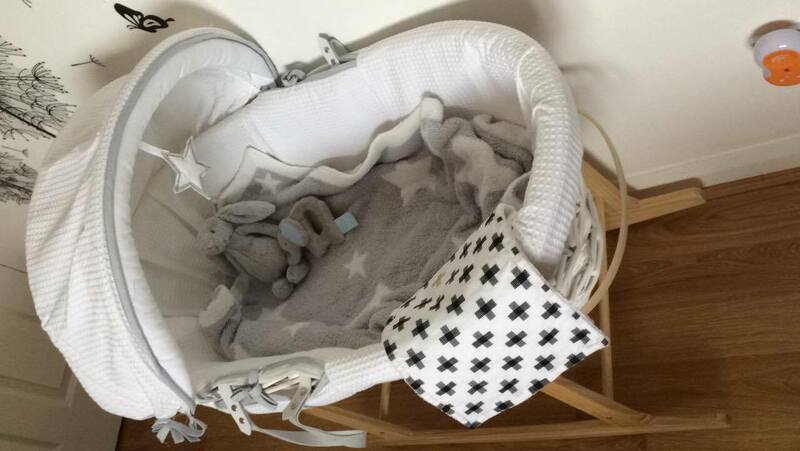 It really is such a stylish moses basket and will look lovely with any room decor. The leather handles are very sturdy which makes it easy and safe to move from one room to another which is brilliant. 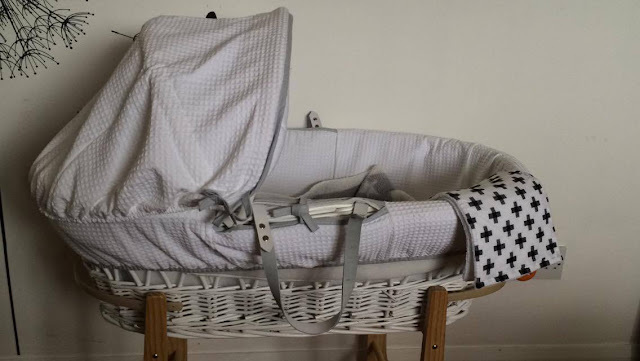 For a moses basket, it is extremely light and looks lovely with the hood up in position or down. I love the dangling star attached as I think it makes the moses basket stand out and Freddie loves to stare at it which is nice. 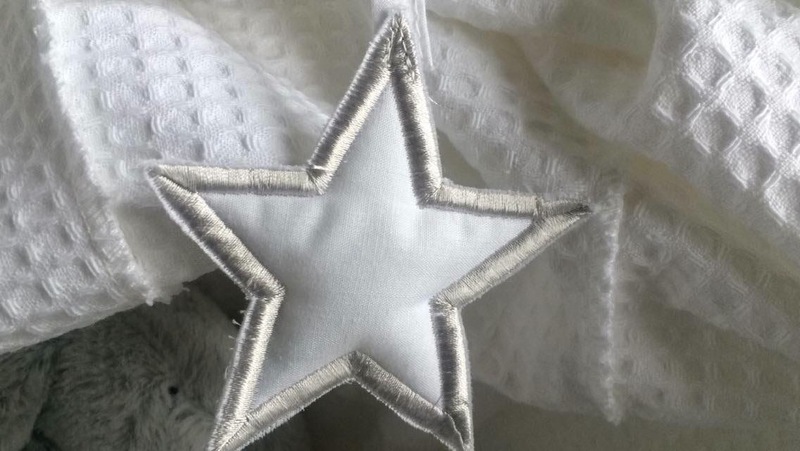 The star has so much detail and you can tell a lot of effort was put in to create this basket. It is really easy to remove and wash the fabric which is always good as babies can be sick quite a lot. (Freddie is a very sicky baby) So its always a benefit when things can easily be removed to wash and clean and attach back on with ease. 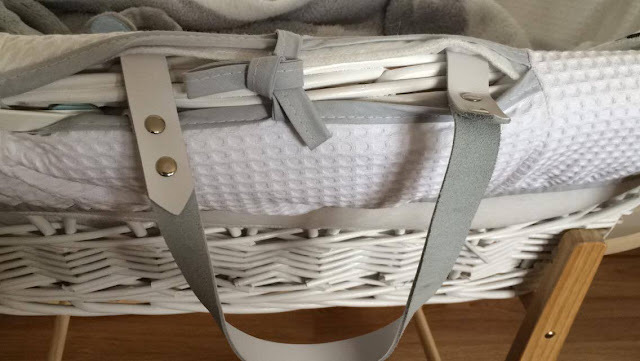 You can either purchase this basket with or without a stand, but I would recommend a rocking stand as they are perfect for sending your little ones off to sleep. Freddie loves being gently rocked back and fore and falls asleep in minutes. 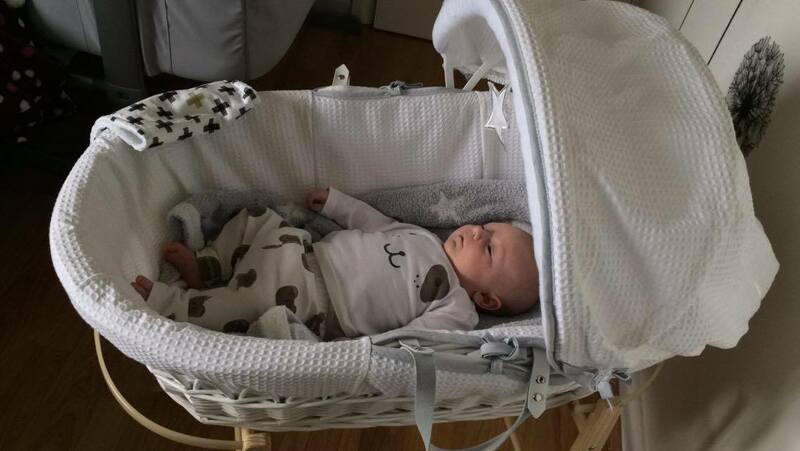 As for comfort, Freddie has no trouble using this basket to fall asleep in. 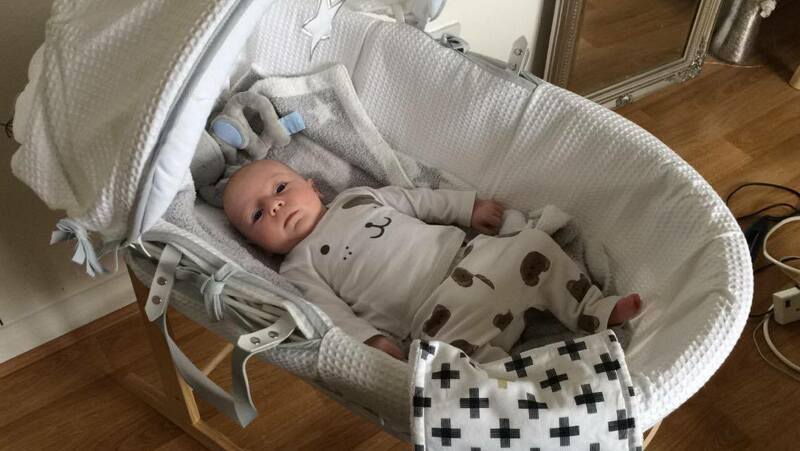 I can put him in awake and he will soon drop off to sleep. He looks so snug and cosy inside it makes me want to be a new born baby all over again. I really do recommend this basket to anyone pregnant or with a new born. 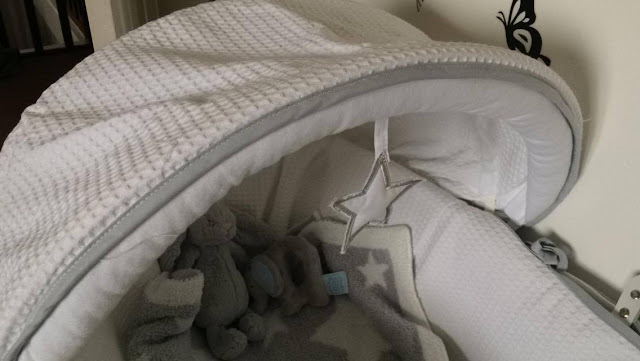 Not only is it beautiful to look at it, It’s really easy to clean, manoeuvre around the house and very comfortable for baby to sleep inside. 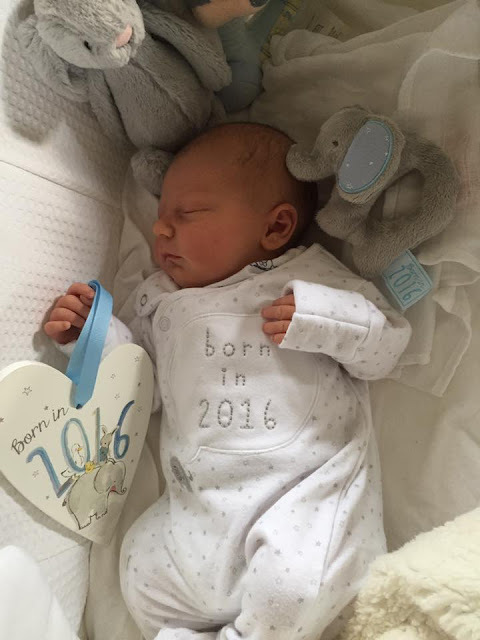 Freddie is currently 7 weeks old and has plenty of room left so it will last you a good few months too! 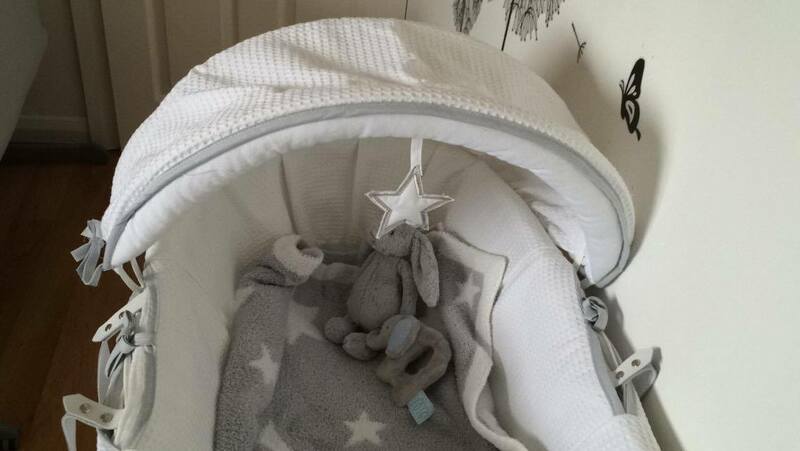 Whenever we have friends and family over they always compliment us on our moses basket. One of my friends has even asked to have it after us as she loved it so much. 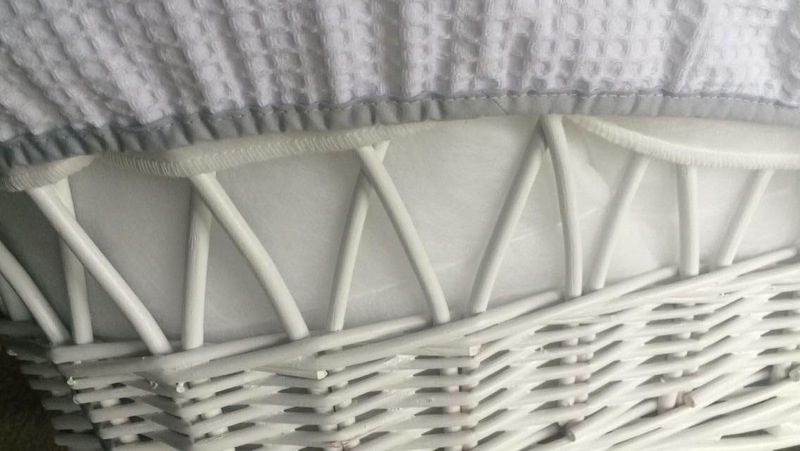 To find out more about this basket go over to the Wayfair website and take a look. It retails at £80.99 (although currently reduced to £71.99 and stand sold separately) which I think is a brilliant price for a moses basket which will be used in your daily routine. It makes the perfect gift to anybody expecting a baby. Freddie and I love it. If you had to pick which colour would you chose? *I was gifted this basket for the purpose of a review but all opinions are 100% honest. Previous Post DISTANCE DOESN’T MAKE THE HEART GROW FONDER.